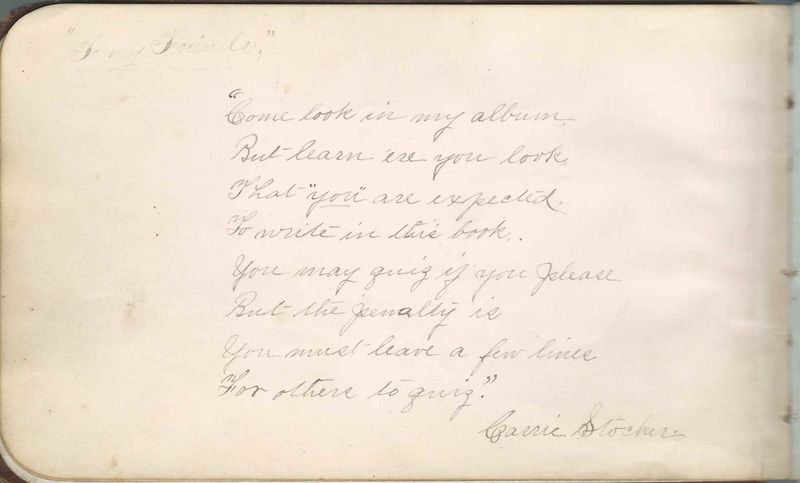 Autograph album kept by Caroline Stocker, "Carrie", of Morris, Illinois, including while she was a student at Morris High School and Morris Normal & Scientific School there. 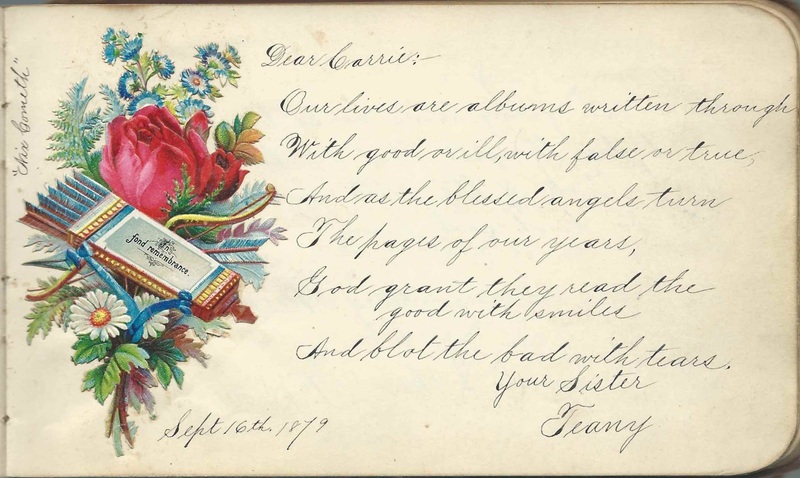 Carrie was given the album by Nellie Clapp on May 18, 1879, as shown below. 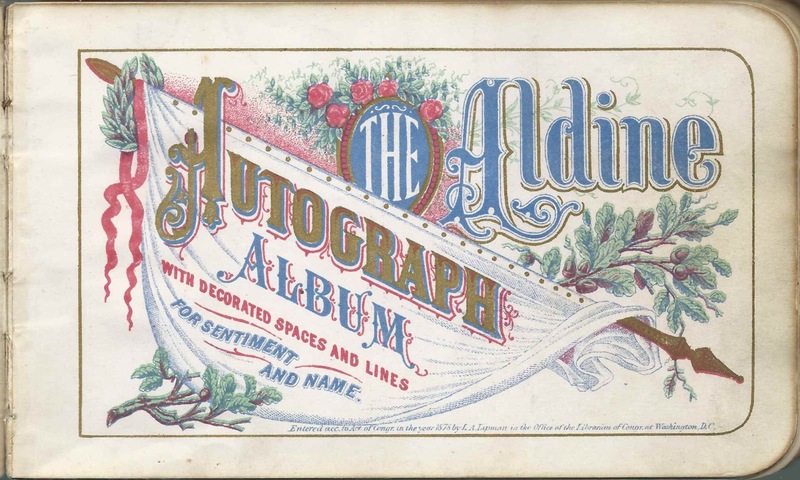 Nellie Clapp inscribed a page in the album on the same day. 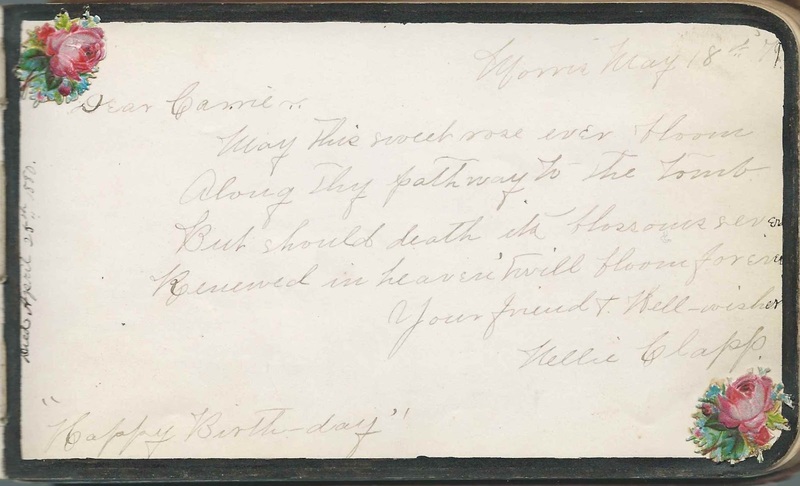 Sadly, Nellie died on April 25, 1880, according to a note Carrie, presumably, wrote on that page. It was probably also Carrie who added a black border to the page, as she did to the page of another inscriber who died. Carrie wrote a page of welcome to her future inscribers, shown below. The album measures approximately 7" by 4-1/4" and contains the sentiments of a hundred or more of Carrie's relatives, friends and schoolmates, some of whom inscribed individual pages and contributed to group pages. An alphabetical list of the inscribers, together with any personal information they offered, appears at the end of this post. 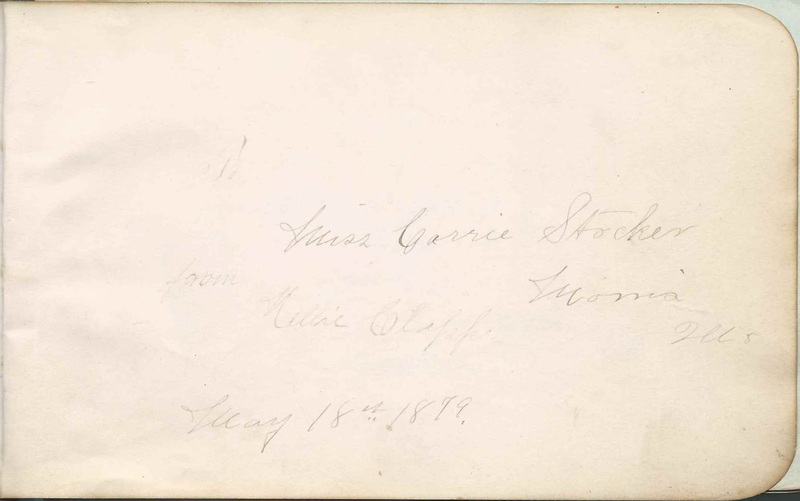 Caroline Stocker, "Carrie", was born May 18, 1861 at Morris, Illinois, the daughter of George Stocker and Mary Magdalene Ellen (Diehl) Stocker. Carrie's date of birth comes from an entry about her son Raymond William Owens in the Semi-centennial Alumni Record of the University of Illinois. Carrie had a sister Christena, who I believe was the inscriber "Teany", who called herself Carrie's sister. On May 12, 1891 in Grundy County, Illinois, presumably at Morris, Carrie married Joseph Doane Owens, son of H. D. Owens and Sarah A. (Wolf) Owens. Carrie and Joseph lived at Morris, Illinois, where Joseph worked as an express agent. They had at least one child, the above-named Raymond William Owens, who was born in 1892. Carrie died in 1922 and Joseph in 1933. If you have corrections and/or additions to the information above, or information on any of the inscribers listed below, please leave a comment or contact me directly. Margaret; inscribed at Joliet, Illinois, on March 29, 1880. In the corners: "M.L.D." and "Barberville". "M.L.D." might have been Margaret's initials. Nellie Clapp; inscribed at Morris, Illinois, on May 18, 1879. She is the person who gave Carrie the autograph album. Carrie's later note: "Died April 25th, 1880". The page is surrounded by a black border, which Carrie may have applied after hearing of Nellie's death. Cora Gifford. Contributed to a page inscribed presumably by students at Morris High School at Morris, Illinois, "Class of 1880". She also inscribed an individual page. 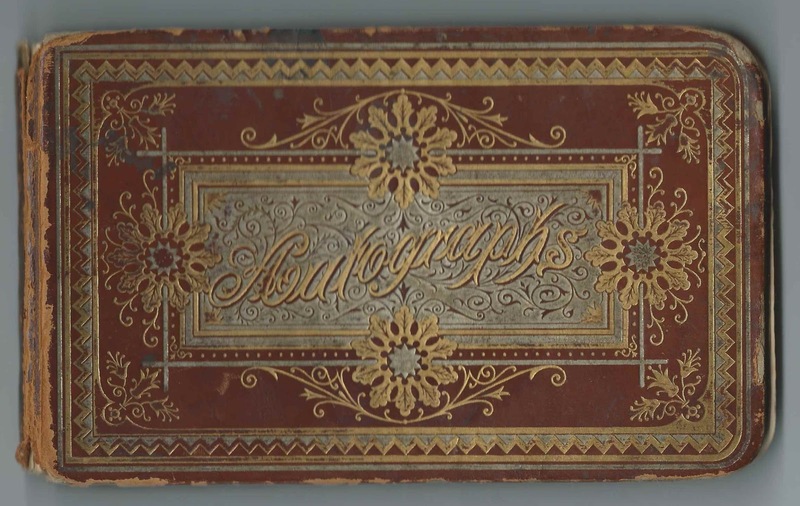 Annie Harkness; inscribed on June 9, 1879. Carrie's later note: "Died May 7, 1882". Found a death record for Anna Harkness, born about 1864 in Illinois; died at Minneapolis, Minnesota, on May 7, 1882. She was the daughter of Isaac and Frances Harkness, who were born in Massachusetts and Vermont respectively. The black border around the page was presumably done by Carrie upon hearing of Annie's death. Terressa Hartshorn of La Salle, Illinois; inscribed at Morris, Illinois, on December 11, 1879. "Are you coming to the next Normal social, so you can have a new "sole" to commence the New Year with?" Nannie E. Mc?, possibly Nannie E. McGrath, as a Nannie McGrath inscribed a shared page. Much of the handwriting on the page is faint. Other portions appear to have been added later with a better ink. Initials "R.Y.C." M. M. Miller of Malden, Illinois; inscribed at Morris, Illinois, on March 17, 1881. "M.N.&S.S. ", presumably the normal school founded at Morris, Illinois, by John W. Cook, later president of Illinois State and Northern Illinois State Normal School. The page has four boxes but all of them appear to have been inscribed by the same person, Hattie A. Minkler, "Het"; inscribed on May 20, 1879 "Remember... and also the story about - well you know what. I will not write it in words". W. Pierce of Verona, Illinois; inscribed at Morris, Illinois, on September 17, 1879. Middle initial possibly T or F.
E. W. Pike. Contributed to a page inscribed presumably by students at Morris High School at Morris, Illinois, "Class of 1880". Also inscribed an individual page. Eliza Reeves; mentions "Mrs. Nape"; "Mr. C."; "snakes"; "Don't forget the last day of the Institute", etc. Nellie M. Rogers; inscribed at Morris High School at Morris, Illinois, on September 16, 1879. Among the reminiscences, "Will is waiting for you. Well I don't care!" Miss Carrie Stocker of Morris, Illinois; presented the album by Nellie Clapp on May 18, 1879. Carrie's name appears on presentation page, and she inscribed a page of welcome to future well wishers. Carrie Stocker; album owner. Contributed to a page inscribed presumably by students at Morris High School at Morris, Illinois, "Class of 1880"
Anna Zimmer; inscribed at Woodstock, Illinois, on August 21, 1879. Emma Zimmer inscribed the right facing page. Emma Zimmer; inscribed at Woodstock, Illinois, on August 20, 1880. Anna Zimmer inscribed the left facing page.